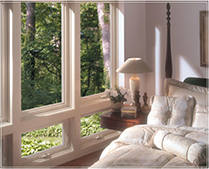 JMJ Custom Windows & Doors is an exclusive authorized dealer of the Imperial LS line of windows from Soft-Lite Windows. All of their products are built to last, and are backed by an on-going commitment to the people who buy them. Quality and commitment to excellence have been the cornerstones of their success and will continue to serve as the foundations for their efforts in the future. 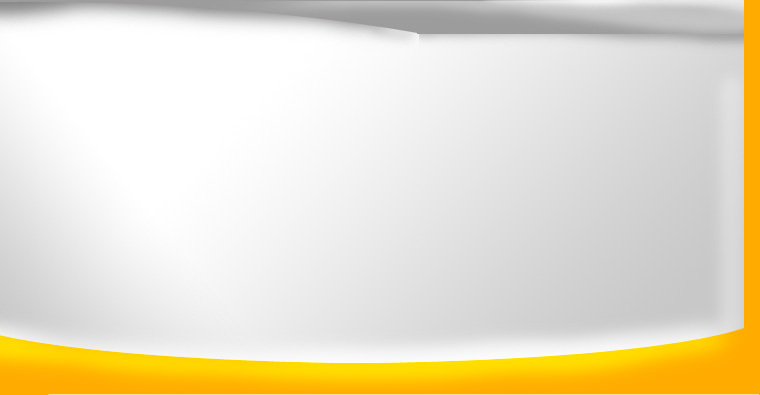 We encourage you to look over their extensive Product Brochure. 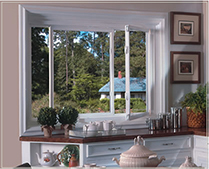 Easy to open and clean, the double hung is a classic style that's been used in all kinds of homes for many years. Their most popular style, they fit most any decor and our designs are the industry's most energy efficient. 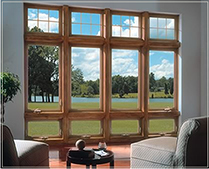 These windows are extremely efficient windows that provide beauty and comfort with features and options that can fit any of your window needs. Soft-Lite double hung windows will not only keep you comfortable with excellent energy efficiency characteristics, they will also keep you smiling with all the great features provided. Hinged along one side and designed to swing outward, casement windows use a crank operating mechanism which creates a tight seal when closed. Popular in newer homes for their clean look, casement windows are the most energy efficient style of operable windows available. Whether in multi-window configurations or as individual windows, casements offer many aesthetic choices and are loaded with features and options so that you can enjoy those beautiful days and evenings in style, comfort and security. As the name implies, this style frames a beautiful outdoors view. Available in many sizes, they can stand alone or be used in combination with other styles to create dramatic designs. The picture window helps to capture a beautiful view or open up the look of the room and can be used as stand alone or in combinations with any other operating window. 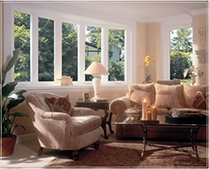 Soft-Lite picture windows offer many energy efficient glass options to provide a greater level of energy efficiency and comfort level. Soft-Lite colors run deep so you never have to worry about scratching the color off. This style has a sash that opens horizontally to let fresh air flow in. Unlike the casement style, this style's sliding sash remains captive in the window’s frame, maximizing the interior space of your room. With popular Soft-Lites lines like the Imperial LS, all the energy efficiency and beautiful features of their double hung window also apply to the Imperial LS Slider window. Brass rollers also ensure easy operation and resistance to corrosion. With a hinge along the top, awnings open outward, allowing air to flow up and in. One benefit of this style is that when left open, the sash prevents a light rain from coming in. The Awning window can be the perfect complement to the space under casement windows. 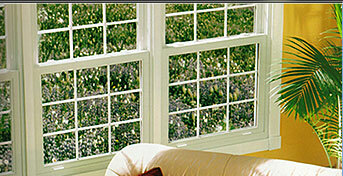 Awning windows are easy to operate and clean. The awning windows deliver an unobstructed view and feature an impressive face profile designed to compliment your other windows and add value to the overall appearance of your home. 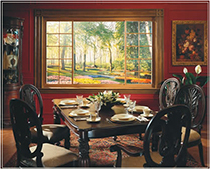 Bays and Bows are combinations of casement or picture windows that project outward. This style adds lots of light and expands interior space. 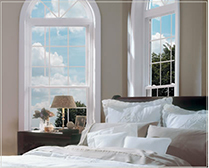 No other windows can change the look and feel of a room like the Bay or Bow window. These windows come with a SuperSeat™ insulated seat board providing increased energy efficiency. These windoows are avaialble in an array of possible configurations and offer solid color choices that run deep from the interior to the exterior of your home to keep the color from scratching off. Popular for kitchens, a garden window adds light and space in any room. This style projects outward and opens at the sides for ventilation – it’s like having a garden right in your home. The Garden window is specially designed to combine the aesthetic appeal of crisp lines with a structural design that ensure lasting durability. 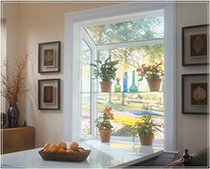 Each Garden window is custom-made to ensures the perfect fit and enhance your living space. Thick glass units are available in many different configurations to fight energy loss and resist condensation. Copyright 2008. JMJ Custom Windows & Doors. LLC. All rights reserved.